Earn up to 1,752 reward points. Added headroom and dynamic response that's easy to install. EMG’s classic J pickups are now available in a completely solderless system that includes everything you’ll need to swap your Jazz Bass pickups with no hassle. EMG have mounted and wired everything to your new control plate – volume, volume and tone pot. Drop in the pickups, plug in the solderless connectors, and play. The EMG JX Set is based off the original J with the added headroom and dynamic response of the X Series preamp. This pickup set has classic jazz bass characteristics with a broader tonal frequency range that adds dimensions and clarity to your bass playing. 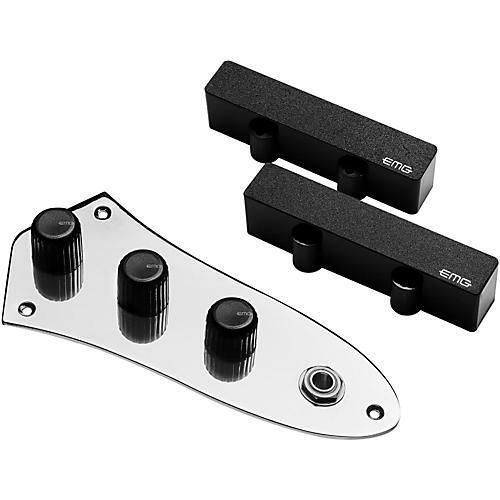 EMG's design has a very low ratio of resistance to inductance, which increases the low end response, while the radiused ceramic bar magnet ensures the tone keeps a tight mid-range punch with dynamic high end response. Whether you play fretted or fretless, live or in the studio, you'll get an incredibly full sound with these bass pickups. Upgrade your sound. Order today.